The people of Israel, or Israelites (Hebrew: ישראל, Yisrāʼēl; Greek: Ἰσραήλ, Israēl; Arabic: إِسْرَائِيلُ, Isrā'īl) trace their ancestry ultimately to Abraham, who established the belief that there is only one God, the creator of the universe. Abraham, his son Isaac, and grandson Jacob (whose name was changed to Israel), are referred to as the patriarchs of the Israelites. All three patriarchs lived in the Land of Canaan, that later came to be known as the Land of Israel. They and their wives are buried in the Ma'arat HaMachpela, the Tomb of the Patriarchs, in Hebron. Map of the Holy Land and the territories of the 12 tribes. The Israelis have been, since before the time of Christ, the chosen people of God. When Abraham was 99 years old, God established a covenant with him, in which he was promised three things: descendants, a land of their own, and victory over God's enemies.Genesis 17 Abraham's wife (Sarah), subsequently gave birth to their first son in her old age, whereas before she had been declared barren. Abraham's son was then given the name Isaac, which means 'laughter'. His name was derived from the time when two angels came to tell Abraham about their coming son, and Sara laughed, doubting the possibility of having a child when she was barren and had passed child-bearing age. Isaac then had a son named Jacob, who in turn had 12 sons: the 12 tribes of Israel. These tribes went on as the Chosen people of God, living in His favor and rule. Throughout the course of their journey to the promised land, they were given a prophecy of a savior who would come to restore them to the Kingdom of God. This savior was believed to be a great king who would come from the line of one of their own, and take over their enemies. The Canaanites from whom the land long took its name (Canaan). By c. 3000-2500 BC the inhabitants seem to have been largely Semitic speaking; they introduced the use of bronze and developed cities. The Bible mentions seven tribes which dominated the region. The Israelis stemmed from the 12 sons of Jacob (Abraham's grandson), each son becoming his own tribe. The sons: Reuben, Simeon, Levi, Judah, Dan, Napthali, Gad, Asher, Issachar, Zebulon, Joseph, and Benjamin all had an important role in the 'country' of Israel. The long struggle for its control between the South (Egypt) and the North (Assyria), in varying political forms, was to dominate the local scene down to the 19th century. The country was divided into large numbers of warring city-states ruled over by petty "kings." A solid Jewish life continued to maintain itself based as formerly on agriculture and increasingly controlled by the intellectual leaders and the "Patriarchs" (presidents of the Sanhedrin) whose authority was in due course recognized by the Roman government. 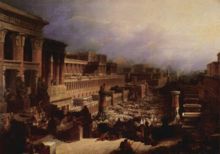 Exodus of the Israelites from Egypt by David Roberts (1830). The Exodus (Greek ex out of, outward and hodos a road or a way) is the abrupt embarkation of the people of Israel from Egypt. It is one of the key epochal events in the history of the nation of Israel. For 400 years, the Israelis were "afflicted"; this "affliction" included enslavement by hard-hearted Egyptians. They cried out in repentance to the Lord, who heard them and sent a messenger. This messenger, Moses, was to deliver the Israelis from their slavery. Traveling to Egypt with his brother, Aaron, he delivered the message to Pharaoh that he was to let the people go. Nine times the Pharaoh refused, each followed by a destructive plague sent by the Lord. At the tenth, the death of all firstborn in Egypt, the Pharaoh relented. The Pharaoh quickly changed his mind, however, and followed the Israelis to the Red Sea. Much to his horror, the Israelis had not been trapped by the body of water, but instead, Moses had parted the sea to let his people pass through. The Egyptian army tried to follow, but once the last Israelite had cleared the path, it fell, killing all of the army. For the duration of Moses' leadership, followed by Joshua as Moses died, the Israelis did well. Their one mistake was refusing to go into Canaan for fear of the large people who lived there. For their doubt, they were caused to live in the desert for 40 years until every last doubter had died. The people of Israel were governed by Prophets which were appointed by God. While the Prophets were in command of the nation, they did good in the Lord's sight, and were blessed. But as soon as the Prophet died, the people fell into godless chaos, doing whatever their flesh desired. The Lord would then deliver them to their enemies, until they repented, and were given a new prophet. This self-destructing cycle continued on into the land they received, Canaan. The United Kingdom of Israel (1095-975 BC according to Ussher, or 1050-930 BC according to Thiele) was a regal government for all of national Israel that succeeded to the semi-direct rule over the Israelites by God through His appointed and raised-up Judges. It began with King Saul and ended with the death of Solomon and the subsequent division of the kingdom into Northern and Southern halves. The Northern Kingdom, also called the "Kingdom of Israel" after the death of Solomon, was a monarchy consisting of ten of the twelve tribes of Israel who revolted against King Rehoboam, successor to Solomon. This revolt happened in 975 BC (according to James Ussher or 930 BC (according to Edwin R. Thiele). The Northern Kingdom lasted until 721-2 BC, at which time King Shalmaneser V of Assyria (or perhaps his successor Sargon II) conquered it and carried all of its people off to exile. That kingdom would never again re-assemble. The Kingdom of Judah was a monarchy, inclusive only of the tribes of Judah and Benjamin, over which the House of David enjoyed an unbroken primacy. This kingdom, like its Northern counterpart, began with the Revolt of the Ten Tribes in either 975 BC (per James Ussher) or 930 BC (per Edwin R. Thiele). It ended with the Fall of Jerusalem in 586 BC. The people of modern day Israel share the same language and culture shaped by the Jewish heritage and religion passed through generations starting with the founding father Abraham (ca. 1800 BC). Thus, Jews have had continuous presence in the land of Israel for the past 3,300 years. After the exile by the Romans, the Jewish people migrated to Europe and North Africa. 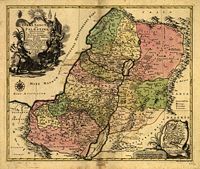 In the Diaspora (scattered outside of the Land of Israel), they established rich cultural and economic lives, and contributed greatly to the societies where they lived. Yet, they continued their national attachments and prayed to return to Israel through centuries. In the first half of the 20th century there were major waves of immigration of Jews back to Israel from Arab countries and from Europe. During the British rule in Palestine, the Jewish people were subject to great violence and massacres directed by Arab civilians or forces of the neighboring Arab states. During World War II, the Nazi regime in Germany decimated about 6 million Jews creating the great tragedy of The Holocaust. Devout Jews still hold to their belief that Jesus was not the Son of God, and that their king is still to come. The country is torn with war, and their enemies have persecuted them for centuries. Over the last century, they have been attacked by multiple nationalities, such as England and Germany. The Germans targeted the Jews for eradication, leading to one of the worst acts of genocide in history, known as the holocaust. This page was last modified on 16 July 2012, at 06:12.